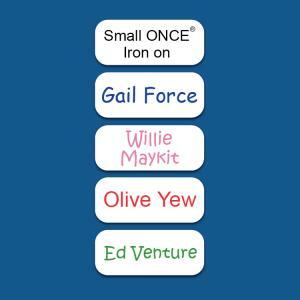 Iron on name labels are a great choice if you have a large quantity of clothes to label. Our specially formulated ONCE® Iron on label takes only six seconds per label to apply, which means you can label a lot of items fast! So long as you follow the simple instructions, they come with a lifetime guarantee. They do not fade and are very durable and the soft, smooth nylon fabric with rounded edges is great for sensitive skin. 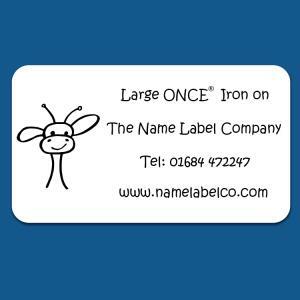 Most people choose our ONCE® Medium size labels (1.8" x 0.5" or 4.6cm x 1.2cm), but we also offer a ONCE® Large label (2.9" x 1.8" or 7.2cm x 4.6cm) in case you have lots of text or want to use it as a name badge on the front of garments or uniform. Our ONCE® Small label (1.1" x 0.5" or 2.8cm x 1.2cm) is great for underwear or if you are looking for a more discreet, neat label without an image. 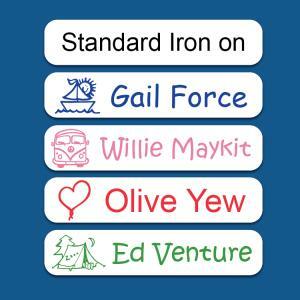 The Standard Iron on choice takes longer to apply and is more of a budget product. 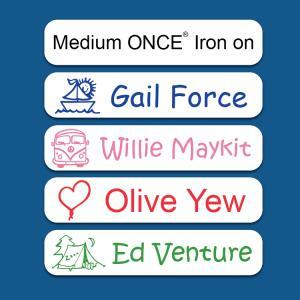 All Iron on orders placed before 2pm weekdays are posted that day.